TFNation ticket sales have now gone live! TFNation is being held this year at the Hilton Birmingham Metropole in Birmingham in the UK from August 11 through the 13 with special guests that include Marvel Transformers writer Bob Budiansky, Blackarachnia voice actor Venus Terzo, IDW artist Jack Lawrence, IDW colorish Josh Perez and John-Paul Jove, and many more. You can purchase your tickets HERE. A full weekend for an adult comes to £60, with Saturday only tickets costing £35 and Sunday only tickets costing £30. Prices are lower for seniors and young adults (16-17), with kids 15 and under getting in free. Make sure to reserve your hotel room as well, as TFNation will be sharing hotel reservations with the Festival of Quilts, meaning sell-outs are a very real possibility. You can find the prices along with some additional hotel information below. TFNation’s home is the Hilton Birmingham Metropole, in Birmingham, UK. £60.75 Single Deluxe room, including complimentary breakfast. £70.00 Twin Room, including complimentary breakfast for two. £70.00 Queen Deluxe, including complimentary breakfast for one or two people. £130.00 Queen Executive, including complimentary breakfast for one or two people and executive lounge access. Family room prices TBC, including complimentary breakfast. Discount rates are available for Wednesday 9th August until Tuesday 15th August. Details on how to book your room will be forwarded to you with your TFNation ticket confirmation email. Book early to avoid disappointment. 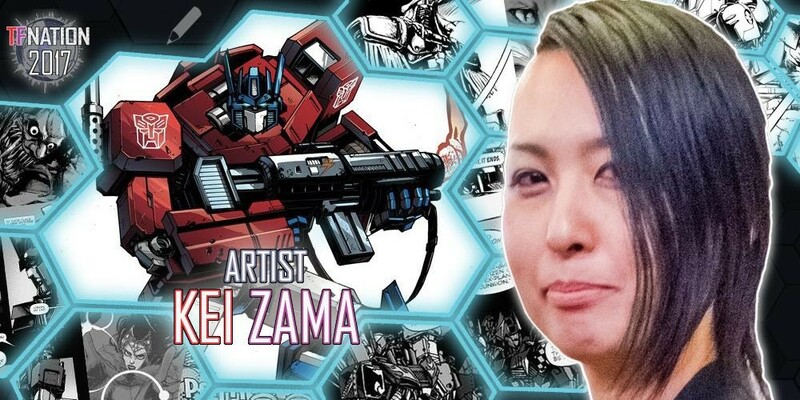 From TFNation HQ, we have another guest announcement for their second annual event in Birmingham, UK - current artist on the Optimus Prime ongoing series from IDW: Kei Zama! Check out more info below. With IDW’s universe of Transformers comics going from strength to strength, the depth of talent involved in creating them grows ever greater and now we at TFNation are pleased to bring more of that greatness to you, in the form of Kei Zama, returning for our second year. Starting with her series of covers for IDW’s Transformer line in September 2015, Kei-sensei has rapidly gained a large fan following, due to her mean and gritty artistic style, as well as her stunning commission work. Following on from her cover work, she is now bringing the continuing adventures of Optimus Prime to life (along with writer John Barber and colourist Josh Burcham) in his current titular series. Outside of Transformers, Kei-sensei made her Marvel comics art debut with last year’s Scarlet Witch #10, has provided art for Sparklight comics, as well as covers for IDW’s Atomic Robo, and recently achieved a personal dream in working on an ABC Warriors-related piece for Fleetway/2000ad. Her Blackblood-themed story (written by the mighty Patt Mills) is set to show off her undeniable talent for monochrome imagery and prove a perfect fit for the tone of this title. We advise all our attendees to keep an eye on Kei-sensei’s blog http://steelandstarlight.com/ for details of her commission list, as the event draws closer. Kei Zama will be signing autographs, discussing classic British rock bands and selling artwork (including her highly-prized sketchbooks) at TFNation 2017 at the Hilton Birmingham Metropole Hotel. We look forward to seeing you there! Are you a creator of fan art, merch, crafts and just generally artsy things to do with Transformers? Would you like to show off your wares this summer at TFNation 2017? The Forge is returning to the event, and the applications are open now! Find out more information below, and good luck if you choose to apply. TFNation is not only pleased to announce that The Forge is returning for TFNation 2017, but also that applications are now open! The Forge, located in a specially designated room just outside of the main convention hall, is our home for fan art and crafts and shall be joined this year by various other features, details to be announced in future transmissions. The Forge is an area for our creative attendees to promote, display and sell their work. Aspiring Forge artists and crafters are required to pre-register their interest by completing the application form linked below. You must be aged 16 or above to make an application. You do not need to have booked a ticket at this stage - you are free to apply before making that decision. Successful applicants will receive an email inviting them to make a formal booking. Applicants who are not successful this time will be notified and will be welcome to apply again in future years. TFNation staff will allow a grace period of 14 days, until March 13th, before reviewing applications. This is to allow as many people as possible the chance to apply. All applications will be reviewed by TFNation staff. If necessary, applications will remain open after March 13th until all spaces are sold. Space will once again be limited, so we recommend getting your applications in as soon as you can. If your application is successful, you will then be able to book your table. Both Forge Craft and Forge Artist Alley stalls cost £25.00, including built in insurance. You must also hold a valid TFNation 2017 full weekend ticket. If you do not hold a weekend ticket then one shall automatically be added to your Forge booking. If you have already purchased a day ticket and your Forge application is approved, then your ticket will be automatically upgraded to a Weekend ticket for an additional price. Full terms and conditions will be available at the time of booking - but here are the important things you need to know about each table type. - For attendees to promote, display and sell any hand-made craft items. Up to three individuals may share a single Forge Craft Stall. - Stalls are only available to attendees who have purchased a weekend ticket. - Some crafters produce art prints of their creations. We are happy to allow these, however toys, sketches and art commissions may not be sold here. This is to protect our artists and traders who have invested a lot of time and money into their stalls. - For attendees to promote and display any art prints, sketches and art commissions. - Artist Alley stalls are for one person only. - Toys and craft goods may not be sold here. Again, this is to protect our traders and crafters. All stalls must be staffed by the person(s) who paid for them. This is to ensure the safety of your stock and our attendees. The TFNation crew are unable to staff stalls. Please CLICK HERE for further details on applying to The Forge. We have another update from TFNation headquarters as they get ready to bring another artist to their evergrowing roster - current Till All Are One and Transformers designer and colourist extraordinaire: Sara Pitre Durocher! More details below, so check it out. It gives us great pleasure to announce that the artist for IDWâ€™s TILL ALL ARE ONE, Sara Pitre-Durocher, will be making her European convention debut at TFNation 2017! Sara first came to the attention of the TF comic fans in early 2015 with a series of stunning covers for MTMTE, WINDBLADE and RID before providing interior artwork for the one-shot COMBINER HUNTERS. After guesting on a few single issues, 2016 saw the start of TILL ALL ARE ONE, with Sara as the resident series artist. Covering the struggles of a rebuilt Cybertronian society, Starscream has never looked so delightfully devious! As an art director at Volta creative studios, TF fans will also have seen Saraâ€™s work elsewhere as she provided colours for many of the Combiner Wars figure packaging art and contributed work to the Transformers Legends mobile game, as well as several other iOS and browser titles. We advise all our attendees to keep an eye on Saraâ€™s Facebook page https://www.facebook.com/spewpew/ for details of her commission list, as the event draws closer. Sara will be signing autographs, talking Starscream, hugging Combaticon fans and selling artwork at TFNation 2017 at the Hilton Birmingham Metropole Hotel. We look forward to seeing you there! Another update arriving from the TFNation headquarters, featuring not one but two more guests for this summer's event in Birmingham, UK! Get ready to meet the double couple combo of Hal Rayle and Maggie Roswell - and find out more about Snarl/Shrapnel/Pipes and Maude Flanders below. We are honoured to announce two very special guests for #TFNation 2017 as the husband and wife team of Hal Rayle and Maggie Roswell join UK fans for the very first time, for something a little different! To #Transformers fans, Hal is best known as G1 Snarl – the surly Stegosaurus member of the #Dinobots. A character so tough he was actually created to bring his fellow Dinobots in line! In addition to voicing the coolest set of solar panels to grace a 80’s kids toy, Hal also voiced Shrapnel throughout the G1 series and the 1986 Transformers Animated movie, (not so tough, we admit) the reptilian Skuxxoid race (relatively tough, depending on payments owed) and finally the VERY TOUGH AND VERY MUCH ALIVE #Autobot Pipes in Five Faces of Darkness. 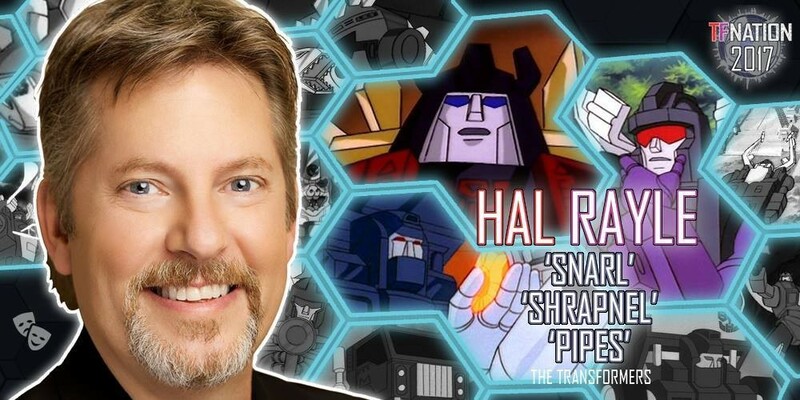 Outside of Transformers, Hal's work could be heard in a number of classic 80s and 90s animations, voicing Arzon in #Visionaries, Deep Six in Action Force, Prince Kro-Tan in Defenders of the Earth, Lieutenant Commander Steel in Swat Kats and numerous other appearances in shows such as Galaxy High, #TMNT and Universal Animation's Back to the Future, in which he clocked up over 65 separate voices alone. 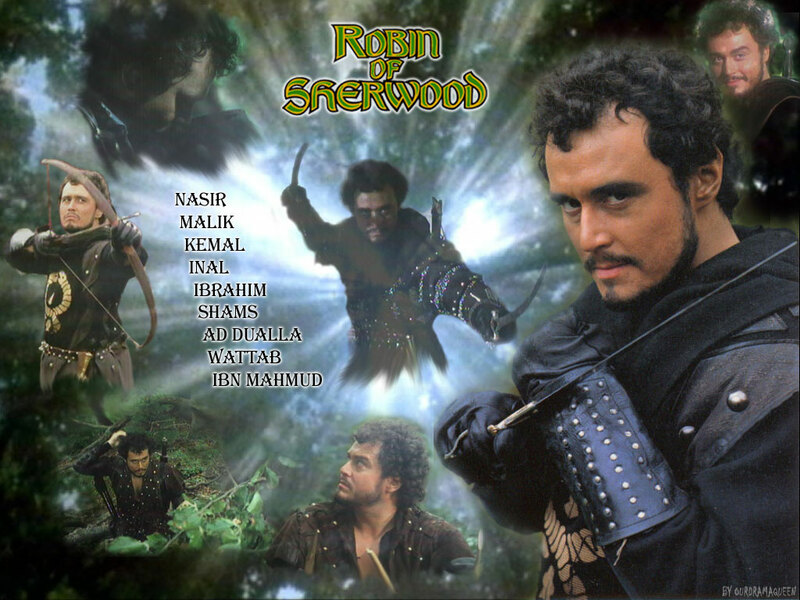 In live-action projects, Hal has leant his voice to many strange creatures including the #Predator in Predator2, all the Ghoulies in Ghoulies and, as his first IMDB credit, voicing an Ewok in Caravan of Courage. Given our attendees are displaying a growing interest in the technicalities behind the mic of voice acting, we couldn't resist the opportunity to bring in someone from the biggest animated series of all time. So it gives us great pleasure in welcoming The Simpsons very own Maggie Roswell to our robotic world. Maggie has been a part of The #Simpsons since the very beginning, voicing regulars Maude Flanders, Helen Lovejoy, Luann Van Houten, and Elizabeth Hoover as well as dozens of supporting and guest characters across more than 175 episodes. Her impact on the show is so great that when she took a temporary leave from the show it resulted in the death of one of those characters! 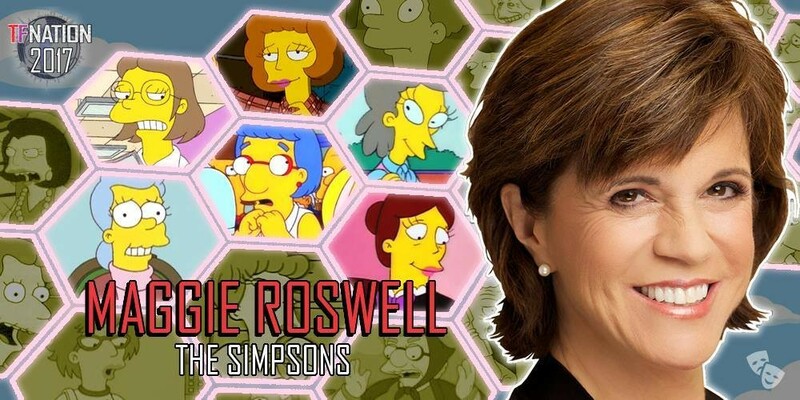 Beyond #Springfield, Maggie’s career is extremely diverse with vocal work for the likes of Mighty Mouse, Darkwing Duck, the feature Fire and Ice and Animaniacs, alongside onscreen performances in shows such as L.A. Law, Remington Steele, Happy Days, #Dynasty, Quantum Leap, Mork & Mindy and many more. That last show indirectly ties into another of Maggie’s interests: improv. Over a long career, Maggie has improvised with the likes of Robin Williams, John Ritter, Joey Bishop, Phil Foster, John Larouquette and, later, Dan “Homer” Castellaneta, and performed on Broadway with the hit Sills and Company. Today, Maggie and Hal manage Roswell ‘n’ Rayle Studios, working with a host of international brands on projects that cover multiple aspects of the audio industry, including coaching, casting, demos, post and developing new media. From G1 Dinobots, Visionaries and Ninja Turtles, to Helen Lovejoy, Sharry Bobins and Queen Elizabeth the Second (yes, we have not forgotten that) Hal and Maggie will be meeting fans, signing autographs and taking part in panels during our convention, which will run from Friday 11th to Sunday 13st August 2017. Yet another update from the folks over at TFNation, the UK's biggest Transformers fan event, featuring a new guest announcement for the 2017 edition of the convention: Tumblr-pandering (his t-shirt says so), tear smoothie-drinker, More Than Meets the Eye and Lost Light writer James Roberts! Check out more info below. 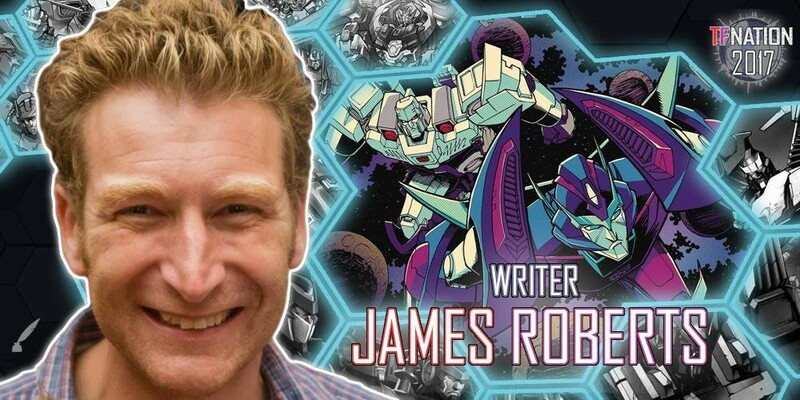 We are delighted to reveal Transformers comic writer James Roberts will be joining us once again, at TFNation 2017! One for the booklovers, James is best known to the fandom as the writer of the highly acclaimed comic series MORE THAN MEETS THE EYE and its much loved successor LOST LIGHT, where he works alongside fellow TFNation 2017 guest Jack Lawrence. An early member of the Transmasters UK community, James came to the forefront after the publication of his (massive) fanfiction EUGENESIS. ALL HAIL MEGATRON #15 saw James’ first professional Transformers contribution, but it was his work alongside Nick Roche on LAST STAND OF THE WRECKERS which really put him on the Cybertronian map. Our mutual friend James Roberts will be signing autographs, hurting your feels and selling scripts at TFNation 2017, which is based at the Hilton Birmingham Metropole Hotel. The lineup grows… we look forward to seeing you there! 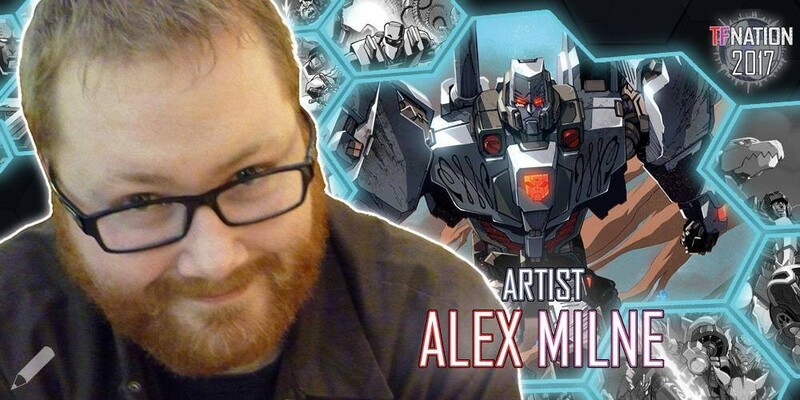 Another update from the fine folks of TFNation, concerning another guest for their second ever convention - taking place this August in Bimingham, UK: IDW artist from More Than Meets the Eye and several more odd jobs across the TF board, Alex Milne! Check out more info below. Since we announced Josh Perez will be in attendance at our 2017 event, a certain artist has been practically kicking in our door to join him! So it gives us great pleasure to announce that Alex Milne will be breaching our defences and motoring into TFNation 2017 to join his partner in crime! Alex is a long time Transformers creator, having provided big bot battles with Devil's Due, Fun Publications and Dreamwave. As the main artist for IDW's TRANSFORMERS: MORE THAN MEETS THE EYE, it is through Alex's artwork that many memorable moments of the IDW canon have been played out in recent years. Life, death, love, hate, justice and betrayal… and that was just his first DJD issue! When comic readers think of characters like Skids, Cyclonus, Tailgate and Megatron, Alex's work is never far from their minds! Our attendees will no doubt be eager to learn of Alex's future involvement in MTMTE's sequel, LOST LIGHT. In addition to this, we are excited to learn more from Alex about his recent work on the ROM / TRANSFORMERS crossover! We urge fans to follow Alex on his twitter @markerguru for details of his commission list, as his work is always is high demand. Alex Milne will be signing autographs, selling artwork and cuddling Josh Perez tightly at TFNation 2017, which is based at the Hilton Birmingham Metropole Hotel. They'll be there – will you? I wish I could go. I bet Alex Milne would be fun to meet. 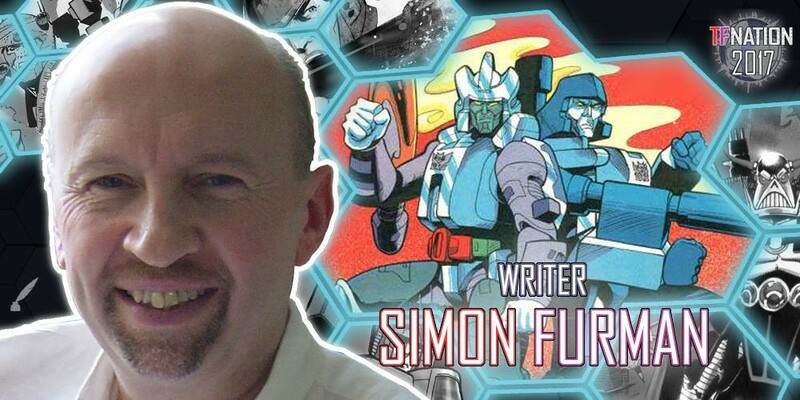 The latest update from TFNation comes as another guest announcement, and another that was inevitable to happen - Simon Furman, the Marvel US, UK, Dreamwave, IDW writer (and for many more still) of Transformers fiction! Check out more info below. For the last three decades, Simon Furman has been one of, if not THE most significant contributors to Transformers lore. Be it comics, television, movies, or games, Simon's influence is still being felt today. From his direct involvement with publications and interactive media, to the ongoing comic stories which have grown out of the rich continuity he pioneered at IDW, Simon's power is beyond measure. Probably of most current significance to fans, Simon is involved in The Definitive Transformers Generation One Collection from Hachette, crafting the most comprehensive collection of Transformers fiction to date and, with the help of fellow TFNation guest John-Paul Bove, making it look better than ever. Fans old and new of the Marvel-era material will not want to miss the chance to see both Simon Furman and fellow guest Bob Budiansky, essentially the fathers of Transformers as we know it, at their first dedicated UK convention together! Simon's body of work outside of Transformers is almost as vast as a predatory bird, with varied comics titles such as Scream, Alpha Flight, What If...?, Thundercats, Doctor Who and much more, and television projects like Dan Dare, Matt Hatter Chronicals, and X-Men Evolution, which also starred fellow Beast Wars co-worker and TFNation guest Venus Terzo as Jean Grey. 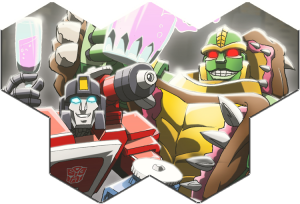 Not content to stop there, Simon has collaborated with Transformers legend Geoff Senior to create the cult Brit-classic Dragon's Claws, recent internet sensation To The Death, and of course, our beloved Freelance Peace-Keeper; Death's Head! It never ends!! Simon's current adventures are detailed on his blog over at: https://simonfurman.wordpress.com and is well worth following! Simon will be signing autographs and selling comics and script packs from Friday 11th until Sunday 13th August 2017 at the Hilton Birmingham Metropole Hotel at TFNation 2017. We look forward to seeing you there! The folks over at TFNation have something naughty to share with us all... IDW artist - but currently splashing it big on the covers of several other publishers too - Nick Roche will be attending the 2017 edition of the Birmingham fan convention! Check out more info below. The engineers have finished reinforcing the foundations, the barriers are erected, and crowd control is in place... so now we can safely announce the return to TFNation 2017 of Nick Roche! We are honoured that he has elected to grace us with his presence, so precious is his time these days! The last few years have seen him tackling a wide range of work and demand is ever-growing, providing covers for ROBOTECH, JUDGE DREDD and DEADPOOL VS PUNISHER, as well as interior artwork for Marvel’s DEATH'S HEAD & NEW WARRIORS, and co-creating the horror comedy MONSTER MOTORS with 'Minions' screenwriter Brian Lynch….and on top of all this he also collaborated with Brit rockers The Darkness to not only provide a cover for their album LAST OF OUR KIND, but an entire music video for hit single BARBARIAN. What’s more, he's busy working on his own creator-owned project… we hope to hear more about that over the weekend! And then there's this little thing called Transformers. 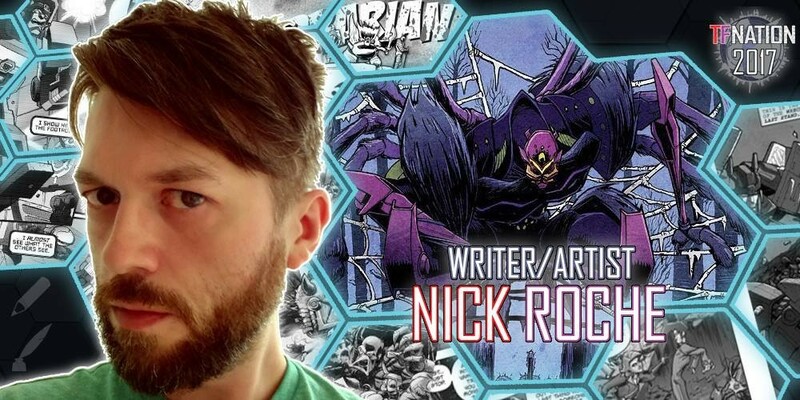 A fan since the Marvel UK days and a member of the long-running TransMasters UK creative community (which also brought us the talents of James Roberts and Jack Lawrence), Nick first worked on IDW’s Spotlight series, followed by Devastation, Maximum Dinobots and a notable issue of All Hail Megatron. Following numerous covers for various series, Nick stunned the Transformers community with critically acclaimed 2010 mini-series LAST STAND OF THE WRECKERS, which broke hearts, shattered trousers and whose influence has been felt in Transformers ever since. His continuing involvement has seen him provide alternate covers for almost every issue of MORE THAN MEETS THE EYE and LOST LIGHT to date, as well as a return to writing with the notably strong SPOTLIGHT: MEGATRON and, most recently, to once again put the Autobot's premier black ops team through the wringer with SINS OF THE WRECKERS. Nick will be signing autographs and selling artwork, somewhere in the middle of the art-fan equivalent of a moshpit, at TFNation 2017 at the Hilton Birmingham Metropole Hotel - we look forward to seeing you there! We are pleased to announce that the ever-charming Stephen Baskerville will be attending TFNation 2017. A seasoned comic and concept artist, Stephen has lent his talents to countless projects during his career, with no sign of letting up. Providing comic art for characters as diverse as Spider-man, Judge Dredd, Snake Plissken, various denizens of the Beano-verse, the JSA and Thomas the Tank Engine as well as videogame designs for the likes of Reservoir Dogs, SpongeBob Squarepants, GI Joe, Doctor Who and Barbie (sadly not all appearing in the one title, that’s one crossover ripe for the taking). 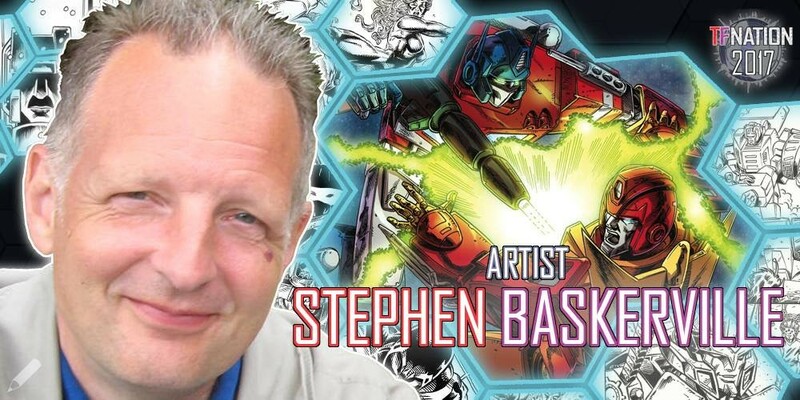 Stephen will be signing autographs and selling artwork at TFNation 2017, at the Hilton Birmingham Metropole Hotel - we look forward to seeing you there! Another guest update from TFNation 2017, as they gear up to start revealing the whole programme for August's event in Birmingham, UK. The archivist of the Transformers world - official and not: Jim Sorenson! Check out more info below. Whilst we begin announcing events and panels for this year’s TFNation, it’s important to note we still have a couple of guests to announce, including an individual whose support and commitment to UK Transformers fans has seen him become an invaluable ally of Team TFNation… ladies and gentlemen, Mr Jim Sorenson! Jim has a passion for researching the details behind the various shows, movies and comics of the franchise. He came to fans' attention when he deciphered the Maximal and Predacon languages used in the TV series Beast Wars. Eventually, he began to share his vast knowledge with fans online, through his blog Disciples of Boltax. Jim's interest in collecting and researching turned into a career with 2007’s Transformers: The Ark, a collection of over 500 G1 animation models, published alongside collaborator and friend Bill Forster. A year later, the pair were back with a sequel, this time showcasing character models from the Japanese Generation 1 animated series. Since then, Jim has released numerous publications on the franchise, all snapped up by eager fans. The Allspark Almanac (volumes 1,2 and combined printing) are considered a treasure trove for fans of the series, over-flowing with easter eggs and hidden references, while subsequent works on Transformers: Prime and GI Joe rewards fans of those series. In recent years, Transformers: Legacy made G1 fans rejoice with its painstakingly researched prints of (almost) all the original Transformer G1 box. Recently, Jim produced The Art of The Angry Birds Movie, tying into their Hollywood debut. Jim has continued to contribute to the TF community in many ways, including the "Ask Vector Prime" for the BotCon magazines as well as his TFNation 2016 work, which included the script reading, giving the audience a few suprises during the show. We are aware that Jim is working on a project involving the TF Universe, but are unable to go into any further detail at present… fingers crossed Jim will be able to unveil the project at our August convention. Jim will also be signing autographs, chatting with fans and considering his Billy cosplay at TFNation - Friday 11th until Sunday 13th August 2017 at the Hilton Birmingham Metropole Hotel at TFNation - we look forward to seeing you there. is he wearing a starfleet uniform? steve2275 wrote: is he wearing a starfleet uniform? The folks at TFNation 2017 have chosen to celebrate the 10th anniversary of the live-action Transformers movies by inviting along a guest who has been there for a good chunk of them! 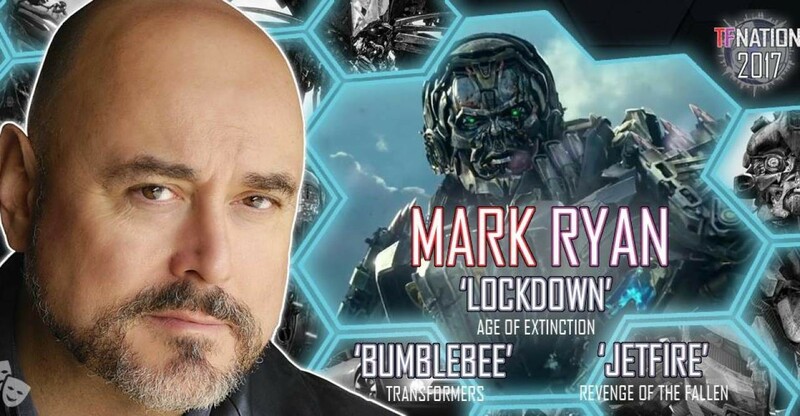 Voice of Bumblebee (2007), Jetfire (2009), and Lockdown (2014), plus a new role in The Last Knight: Mark Ryan! Check out more information below, and head here for tickets! In addition to the above, Mark interacts with human characters to provide the on set voice and presence of many Transformers, before they are added in via the magic of CGI. This means he has an incredibly rich experience of life on a Transformers movie set, as well as post-production work. Yeeeyyy!!!! Hope he can make it, I love his Lockdown. And I wish he had stayed to voice Bee through all the movies, it was perfect for the guy. Hmmm. Which movie do I get him to sign? I guess AOE. But TF1 would have more sentiment value. Ah, decisions decisions. Insurgent wrote: Yeeeyyy!!!! Hope he can make it, I love his Lockdown. And I wish he had stayed to voice Bee through all the movies, it was perfect for the guy. Hmmm. Which movie do I get him to sign? I guess AOE. But TF1 would have more sentiment value. Ah, decisions decisions. Why not both? I'd get him to sign RotF as well cos I liked Jetfire a lot. Actually, that's a good point. There isn't a limit, is there (within reason). I'll get both signed.